My rating: 8/10, Very good watch. Two tone design, deployment clasp. 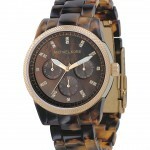 Michael Kors MK5976 watch is another stunning addition to their line of designer timepieces. 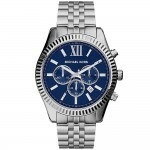 The stainless steel and gold plate two tone style mixed with the deep blue dial is a very luxurious looking design, it gives the watch that expensive feel to it. Chronograph watches always seem to be in demand and I like the overall design of it on this watch, my only bugbear would be the date display cutting into it, could have just done without perhaps. When it comes to the weight of the watch it’s a little heavy which gives it that durable solid feel that a lot of people tend to like. When it comes to the build of the watch they’ve gone for a Japanese quartz which is known to be highly accurate. The casing and strap are all made of stainless steel which adds to that weighty feel. One of my favourite aspects is the deployment clasp with push button release, I just think they are a lot nicer than your standard fold over clasps, you can see a picture of this below. You may also like my 100 best watches under £500. Band Stainless steel two tone design, standard length, 20mm width, push button deployment clasp. 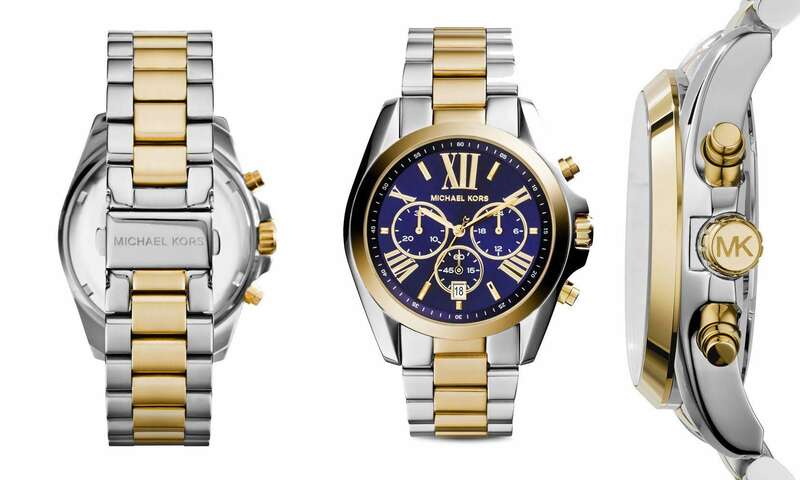 Case Stainless steel, sizing diameter: 43 mm and thickness: 13 mm. Dial Large Roman numeral design. Mineral glass which is highly scratch resistant. Simple date display. Movement Japanese quartz movement which is known to be accurate. Chronograph function. Analogue display. High quality deployment clasp with push release is a lot nicer than traditional fold over clasps. Lacks any luminous features which may make it harder to read in dim lit conditions. The date display cuts into the chronograph dials which may put some people off. 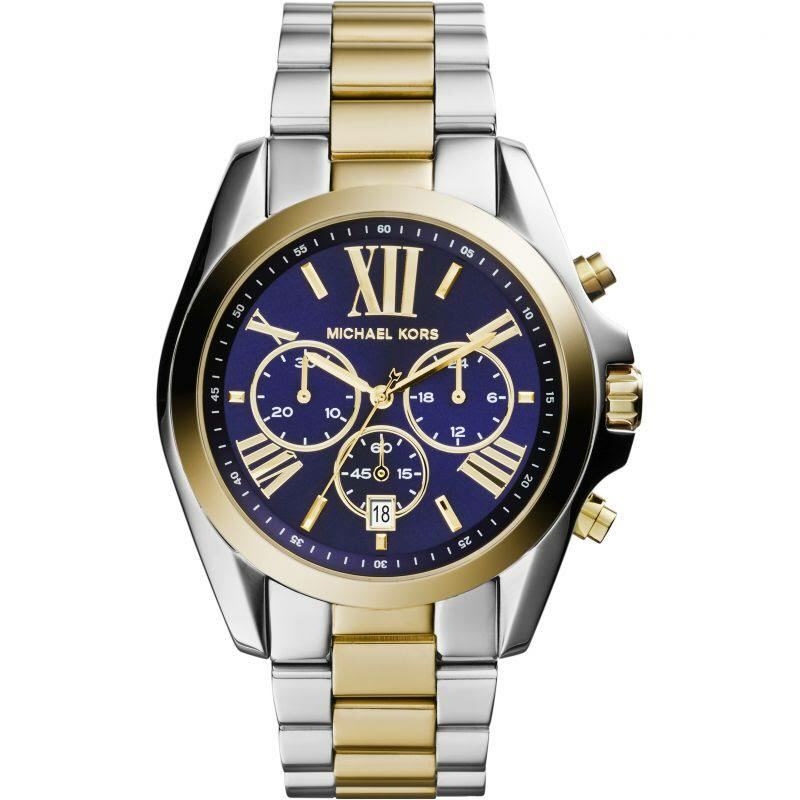 Michael Kors MK5976 watch is perfect for those after that luxury feel at an affordable price point, it’s a well built timepiece by a designer brands and I honestly haven’t got many negative points to make about it. The lack of luminous features may be an issue but it’s quite common on a lot of features so it’s not a massive deal breaker. I suspect the date display bothers me more than it will many other people as well. Overall though I’m very much a fan of the watch and continue to be surprised by the quality of the watches Michael Kors are producing. 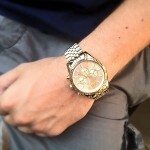 Hope you enjoyed this Michael Kors MK5976 review. Find more watch reviews below.